Lopes, C. From walls to calls: Africa and Europe can shape the future. GREAT Insights Magazine, Volume 6, Issue 5. November/December 2017. Walls make a lot of headlines these days. So do sea crossings. Walls signify a desire to exercise sovereign control at a time when we are experiencing an erosion of borders and enhanced human mobility. Sea crossings are a revisit of desperation routes used by those who have nothing to lose but believe they have a lot to gain. In both cases there is drama, emotions and fear. Several political actors attempt to put on a brave face and defend the indefensible. Rational explanations vaguely associated with real facts serve to stiffen positions on national threats, security concerns and economic vulnerability. Political debates in Europe are increasingly focusing on the strength of populist proposals and the appeal of fake news based on fear. 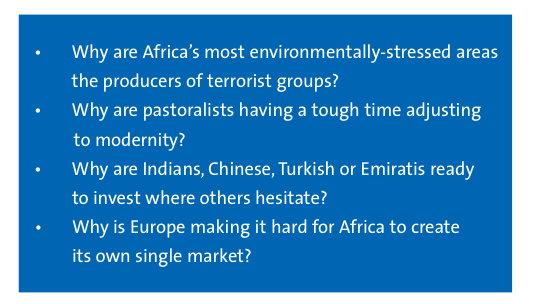 Africa, already seen from a negative lens, is broadly perceived as an issue, even by the most progressive and well-intended minds. It is as if the continent next to Europe – and so intrinsically linked to its history – was suddenly seen from a different lens, the demographic bulge lens, so overwhelming and catastrophic. Populists fear migration; others fear the lack of good governance or respect for human rights and rule of law, pre-conditions for modernity. They feel insecure without it being there in Africa, and hide the same fear under patronising attitudes. One solution for addressing this complexity could be to finally ensure Africa’s growth and development. Many blueprints are drafted, refreshing the development industry preferences, with the best of intentions. New jargon is introduced and a new universal framework is now available. If accepted it could flood the needy countries with new investments and opportunities; which in turn will go a long way to arrest the floods of increasingly young migrants looking for Lampedusa. This narrative is so dated. But, the problem with dated narratives is that they are partly true. Leaders from Europe and Africa will meet in Abidjan for another Summit between the two continental neighbours. The high-level representation from Europe will be less than the attained in the previous Summit in Brussels, in 2015. This time some African leaders, uninvited in Brussels, may find a slot for their jets at Felix Houphouët Boigny Airport. The media may capture these gimmicks as the newsworthy part of the gathering. The dated narrative will content the rest. That would be a pity., as the Abidjan Summit should be about something else. We fast forward to 2017 and observe that most of Europe is ageing and Africa is the youth repository of the world. Its population will be around two billion by 2050 with an average age below 20. Some may think it is insane. But, let’s pause. Never in human history have we witnessed this kind of demographic bulge when the rest of the world population ages. How are we going to interpret intergenerational solidarity, say in Europe, when the new generation is in a different continent, perceived by some as far away and unrelated? Answering these questions could open incredible opportunities for cooperation, and… change the narrative. A proper fight against terrorist groups is not possible without addressing the critical environmental threats the Sahara Sahelian band faces from coast to coast. Pastoralism could be an immense resource to accelerate inclusion and develop regions that require little to advance their people’s livelihoods. Improving agricultural productivity can expand the offer for processed food in great demand by middle-class consumers and urban dwellers. Africa’s agricultural promise is immense, non-used or misused arable land plentiful and growth potential unmatched anywhere in the world. Despite the hype about technological disruptions on productivity and manufacturing, Africa’s low base and huge internal markets (once integrated) offer a large window for industrialisation, partly through commodities value addition. Some technological developments increase Africa’s leapfrogging potential, like reduced cost of renewables and frugal innovation accelerating green industrialisation. New partnerships are tapping into these opportunities. Paradoxically, those arriving late are the ones establishing a commanding lead in the new Africa. China Foreign Direct Investment (FDI) in the continent only ranked 6th five years ago, when it was already by far the number one trading partner. This year it has jumped to the top position. Newcomers are overtaking European partners that have a long history of economic presence in the continent. The discussions with the European Union must centre on the future, economic transformation and industrialisation included. This may be incompatible with the push for the ratification of the current Economic Partnership Agreements (EPAs). There is a high degree of cynicism about the EPAs. It is not a coincidence that Africa’s private sector is the most vocal against it. The European Commission cannot deny the lack of transparency, and even imposed secrecy, in the way the EPAs were negotiated. One of the casualties of the EPAs is the fragmentation of Africa trade negotiations in blocks and countries to whom different clauses were offered at the very moment the Continental Free Trade Agreement was supposed to occupy minds. Another is the possible lost opportunity for a real economic partnership based on the future. Where to start? The best way to begin responding to the populists is to recast the demographic discussion. No one should assume it is easy. Yet, large European migrant populations across the globe know that with time, success is desirable and achievable. Rousseau would also agree. Carlos Lopes is Professor at the Graduate School of Development Policy and Practice, University of Cape Town and Visiting Fellow at Oxford Martin School, Oxford University. Photo: Wooden refugee boat. Credit: Sea-Watch.org via Flickr.